For the past five years, the U.S. Department of Energy’s Brookhaven National Laboratory has partnered with a local chapter of Girls Inc., a nonprofit organization that meets the specific challenges facing young women. The partnership helps to encourage young women towards careers in science, technology, engineering, and math (STEM). This year, the Lab hosted 44 girls over a two-week period, engaging them in real-life science experiments and activities. This summer, during a career panel enrichment component of the program, participants met three Lab researchers: Prerana Kankiya, a software developer designing controls for particle accelerators; Fatima Foflonker, a microbiologist, computational biologist, and algal biofuels researcher; and Kashmira Nakhoda, an optical metrology researcher. The three women shared what personally inspired them to pursue a STEM career and the challenges they faced. The women also offered advice about balancing work and life. To meet the world’s growing energy needs, Brookhaven researchers are working on developing groundbreaking and “game-changing” technologies for better batteries and efficient, sustainable energy resources. “The students became familiar with basic electrical circuits and the science behind alternative sources of energy,” said Susan Frank, an educator from OEP and the lead instructor for this portion of the two-week program. To keep it interesting, Frank had the participants make a nanocrystalline solar cell using berries, and then design and construct cardboard model houses that that would get energy from solar power. They also investigated the chemical properties of metals used in batteries and built a wind turbine. On the last day, students moved the model houses outside and watched the LED bulbs light up from the solar panels they had had built and connected to the model house. Shaivya and Kaavya Sethi, twins from Bethpage Middle School, said they enjoyed the project. “I liked learning how wind, solar, and battery power actually work,” said Kaavya. “It was really cool when our solar panel worked and the light in our model house went on,” added Shaivya. “There’s nothing better than seeing the sense of accomplishment on all of their smiling faces,” said Frank. Moving from energy research to biofuels, the second week focused on the basics of working in a laboratory — from using micropipettes and microscopes to working with different strains of bacteria. The week was led by OEP educator Amanda Horn. The girls also used corn, potatoes, duckweed, and filter paper, along with specific enzymes and yeast, to produce their own biofuels. “I’ve been to the Lab’s science camp a few times and I just love being here. This was a really fun week and I learned a lot,” said Gionna Pillitteri, a 10th-grader from West Islip High School who says she wants to be an astrophysicist or a biologist. “Working with these young, inquisitive students who get excited when their experiment is a success is the best part of teaching,” said Horn. Lauren Cottral, a participant in Brookhaven’s High School Research Program who worked in the physics department this summer, first visited the Lab as a Girls Inc. participant a few years ago. Cottral spoke to the current Girls Inc. participants on her positive experiences at the Lab. Erika Patterson, a winner of the Lab’s 2018 African American Affinity Group scholarship, also first came to Brookhaven through the Girls Inc. summer program. “We are pleased to be part of this collaborative program that is definitely having a positive impact in diversity and inclusion, and encouraging young women to pursue STEM careers,” added White. 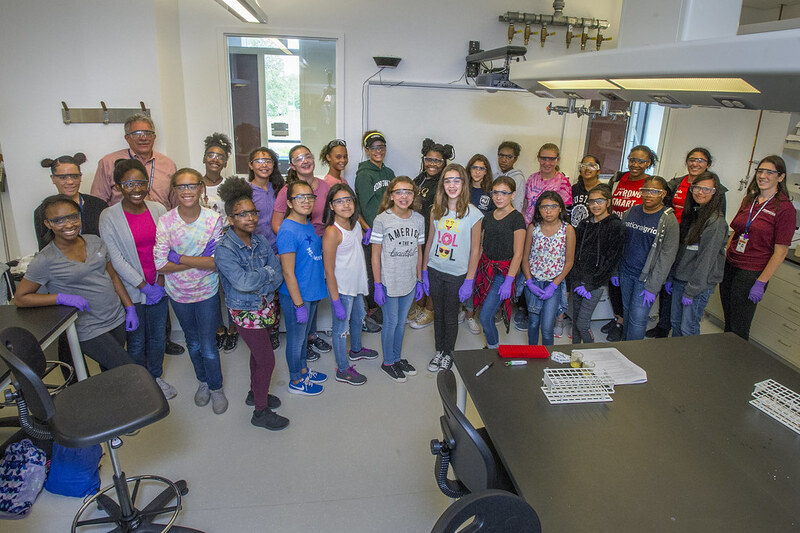 The Girls Inc. program at Brookhaven Lab is funded through National Grid’s Patricia Clark Michels Memorial STEM Camp Scholarship, which has committed to sponsoring 40 girls each summer to come to Brookhaven Lab for five years. Additional financial support comes from the Long Island Community Foundation and PSEG.